In preparation for the upcoming school year, which is less than a month away, there will be some changes made at Clinton County High School pertaining to how a visitor will enter the property. In the front entrance, a security post has been built where visitors will be checked in to a certain degree before being allowed to proceed to the parking lot of the school facility. According to Clinton County High School Principal Stacey Evans, the security post is a safety issue she believes will add another level of security to the facility. Evans said when parents come in, they will have to stop at the security post first and state their business. The building will also help with determining whether parents are supposed to be on the property or not according to Evans. As far as who will be working the security post, Evans said there will be several classified positions that will be moved around in order to keep different people working the post throughout the day. Parents will continue to drop off students in the same spots they are already accustomed to. There have been talks of using Albany Elementary Principal Tim Armstrong’s program utilized at AES for school pickups in the parking lot on the opposite side from the main entrance, but according to Evans that hasn’t been completely worked out yet. Armstrong’s company, SMT Solutions, is a company that developed the QR code scanner that puts students and parents names with a code to make sure the right person is picking each student up. Evans said the main purpose of the building is to have someone in the post from around 8 a.m. until 3 p.m., but could also have other purposes when sports is concerned. Evans said the main purpose of the security post is to add security to the property. Evans believes this will take a lot of congestion away during the school days. 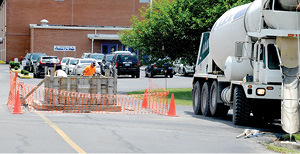 A construction crew filled the forms with concrete as the base section of a security post booth was beginning to be built on the campus of Clinton County High School. The new post is an attempt to heighten security by offering school officials an additional way to monitor and control incoming and exiting traffic at the school.